With the unusual New Palace, Wilhelmine added a further feature to the Hermitage. In 1750 a fascinating example of park architecture was begun on the site of a former hedge labyrinth west of the existing palace – which from then on was known as the "Old Palace". The focal point of the oval complex is the so-called Temple of the Sun, with two arcades curving out from it on either side. They were used to house exotic plants in the winter, and on the end of each arcade was a large aviary. 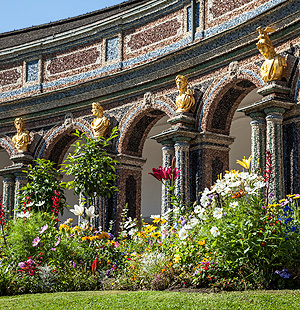 The northern half of the oval consisted of pergolas, some of which have been reconstructed, with niches containing sandstone vases. This palace complex can only be fully appreciated when its symbolism is understood. The Temple of the Sun is the palace of Apollo in heaven, from which, according to mythology, the god departs in his sun chariot every morning, to cross the world and fill it with his light. The world beneath him is represented by the oval shape of the complex. The pool symbolizes the sea, the aviaries with the birds the air and the plants the earth. The Apollo theme is also reflected in the red, blue and yellow paste and rock crystal decoration of the Temple of the Sun and the two wings, which gives the complex its fairy-tale appearance, as Apollo's palace was made of crystal. The architecture was thus intended to look as if it was built of pure light, as was appropriate for the heavenly temple of the sun god. The building is modelled on stage sets by the theatre architect Galli Bibiena, who periodically worked in Bayreuth. 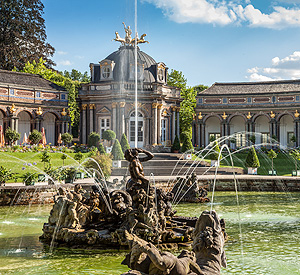 The whole building was of course a glorification of Margrave Friedrich as the Apollo of Brandenburg, who ruled over the seasons as sun god and with the rays of his wisdom and majesty caused life in the margraviate of Bayreuth to flourish. Unfortunately none of the unusual interiors have been preserved due to bomb damage in the Second World War.